Canadian superstar Justin Bieber has rested his well-coiffed head all over the world. And we have the real estate proof to back it up! While he’s been a prolific renter, the 24-year-old singer recently made headlines on the “home” front. Bieber reportedly picked up a 101-acre property with its own horse racing-track in Ontario, Canada, for $5 million, according to TMZ. For those with short memories or Bieber-related blockages, the young pop star had his first taste of fame a decade ago. His initial YouTube videos created a sensation back in 2008, when he was just 14. Not too many years later, the singer made his first splash on the real estate scene—and not necessarily in a good way. He paid $6.5 million for a property in a gated Calabasas community in 2012, when he was only 18. And it was a savvy investment, since he strolled away with a decent profit when he sold it two years later. However, just months before the $7.2 million sale to Khloe Kardashian, he was charged with vandalism for egging a neighbor’s house, and had to pay $80,000 in restitution. That’s a lot of eggs! 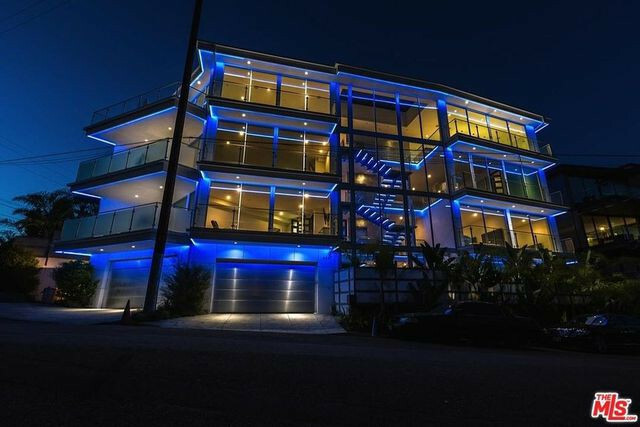 The mansion offers a “nightclub, a movie theater, a gym, three bars, an elevator, a hideous Hollywood Sign rendered in blue glass tile, 10 bedrooms, 18 bathrooms, and neon everywhere,” according to Curbed. If you’re interested in experiencing a little pop star magic and have around $35,000 a month to burn, the party-ready manse is currently available for rent. Toward the tail end of 2014, the peripatetic pop star was on the move again. This time, he chose an unusual-looking modern residence in Beverly Hills. This time he picked a place farther away from neighbors: the “salad spinner” house, designed by architect Ed Niles. The home’s curvy glass and steel structure resembles the kitchen appliance. The 6,500-square-foot property was on the market for almost $15 million. With no takers, the home was then offered as a luxury rental for $59,000 a month. Bieber apparently promised to rent the place for only a short period of time, which must have been some consolation to nervous neighbors. True to his word, the social media star did move out of the salad spinner—and into yet another rental in Beverly Hills. The five-bedroom mansion featured “sweeping views and graffiti art,” TMZ reported at the time. The new digs were also a relative bargain at $35,000 a month. And even though Bieber had departed the salad spinner, the drama wasn’t quite over. Rapper Meek Mill reportedly moved into the transparent space for a single weekend, and shook things up when he hosted a Grammys after-party, with guests including Nicki Minaj, French Montana, Khloe Kardashian, and Bieber. A fight reportedly broke out, and ice sculptures as well as punches were thrown. While no arrests were made, the house had been trashed. One silver lining for Bieber? The place was no longer under his purview. A new year and a new lease. This time, the performer had a new neighborhood and privacy in mind with a rental in Toluca Lake. This 10-bedroom retreat included a pool with a waterslide, a guesthouse, game room, home theater, and gym. The spread also provided the star with recreational activities, but nothing too naughty. In an interview with the BBC, Bieber said he liked to go bass fishing off the dock or row his boat on to the lake. The pricey pad set him back a whopping $80,000 a month. While on his Purpose world tour, the singer set his sights on a posh pad in the Hamptons. Page Six reported the superstar really, really wanted to stay at a place known as the Sandcastle while he was in the NYC area. However, the house was booked and no amount of money would allow Bieber in the front door. Instead, Farrell loaned Bieber a different mansion for free. Normal rent on that place? $80,000 a month! Farrell received a priceless gift in repayment: The homeowner and his 12-year-old daughter were invited backstage at a Bieber show, Page Six reported. The musician topped off the year with a rental in London. Apparently taking a shine to the area, Bieber reportedly planned to split his time between the United Kingdom and L.A. He rented the posh property in October for almost $133,000 a month, Architectural Digest reported. Located just outside London and set on 2.5 acres, the 27,000-square-foot mansion included 15 bedrooms, 13 baths, indoor and outdoor pools, gardens, a tennis court, home theater, and wine room. Despite neighborhood demands to keep the singer out of their exclusive ZIP code, Beverly Hills was powerless against Bieber. This time, he moved into a 8,600-square-foot contemporary estate with six bedrooms for $55,000 a month. The spread is ideal for a tenant who wants to entertain, and comes complete with an open floor plan plus a gym, home theater, and office. 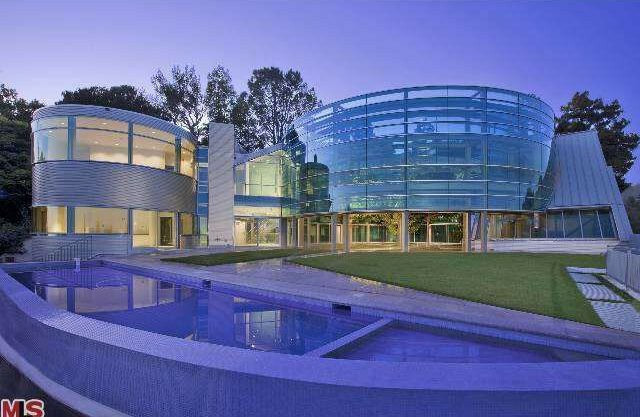 Bieber began this year with yet another rental: a relatively tiny, 6,000-square-foot space in West Hollywood. TMZ reported that the 24-year-old is apparently spending about $55,000 a month on the cozy spread. This space has just three bedrooms. However, all his favorite amenities are in place. There’s a home theater, an infinity pool, and a very slick closet in the master bedroom that looks like a DJ booth. And if he truly wants to spread out, he now has his spread north of the border. The serial renter dipped his toe back in the buying game, picking up a fancy mansion in his Canadian hometown for $5 million. The 101-acre, lakefront spread includes a 9,000-square-foot main house with “four bedrooms, six baths, three fireplaces, game room and movie theater,” TMZ notes. There’s also that private horse-racing track. Giddyap!